Remember fudgesicles? That creamy, rich, decadent fudge popsicle with the texture of ice cream?!? Well, put all the store-bought popsicles to shame this summer with these dreamy, refined sugar free, vegan frozen treats! I remember walking down the frozen section at the grocery store as a kid, looking for those chocolate popsicles. Every now and then my mom would cave and buy us a box, and they were my absolute favorite! 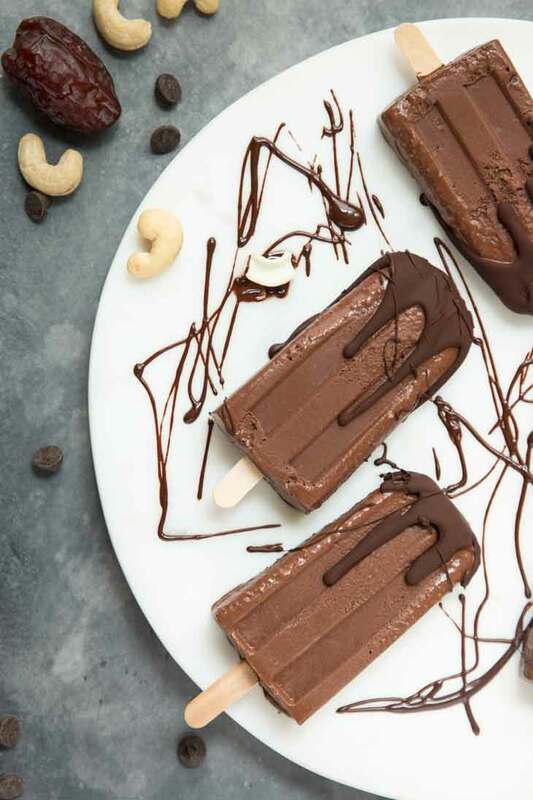 I’ve had healthy vegan fudgesicles on my list of recipes to develop for quite some time. Especially the guilt-free kind you can even have for breakfast or snack! He got down from his chair, picked up a piece of paper and pen, and started asking me what went into the recipe so that he could write it down. It was the most adorable moment for any food-blogger mom! Plus, if it weren’t for him, I probably wouldn’t have written down the recipe. What Makes These The Best Creamy Fudgesicles Ever? Sweetness. Dates were the sweetener of choice in this recipe. Not only do they add that rich caramel sweetness, but they’re also thicker in consistency than most other natural sweeteners. 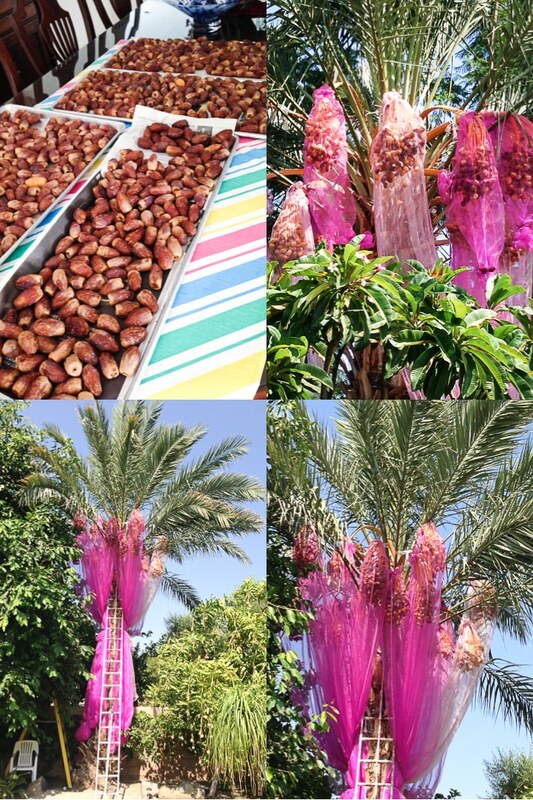 My in-laws have 100s of large Medjool Dates growing in their backyard in the Coachella Valley. Words can’t describe how amazing these home-grown dates are! So it’s safe to say that we always have a plethora of fresh dates in our fridge year around, and they are my go-to sweetener with blended recipes. Creaminess. Coconut milk was my first pick for this recipe. I love using it for popsicles, frozen desserts, and as a substitute for cream at times in savory recipes. And if you’re not a fan of coconut, don’t worry. 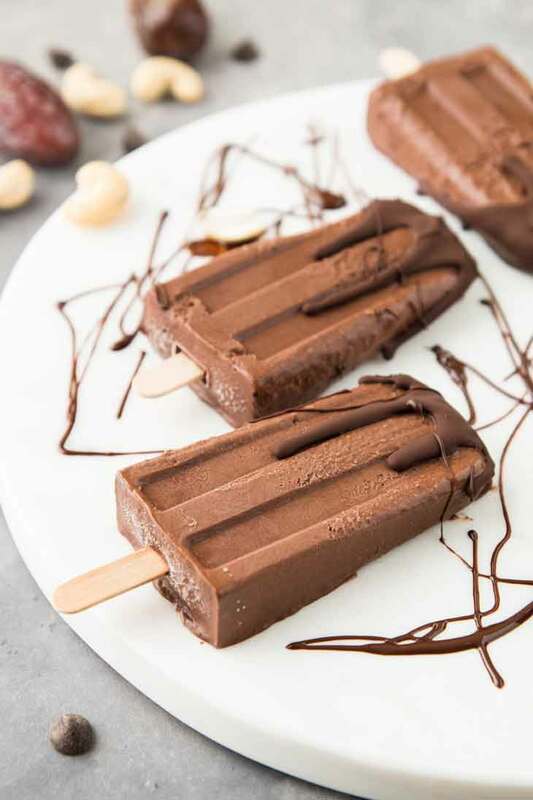 These chocolate popsicles are so rich and chocolatey that you won’t even get a hint of coconut in them. Fudge. 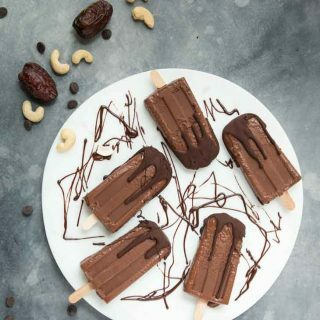 I wanted these popsicles to be more than just chocolate ice cream on a stick; to actually be fudge in texture and taste! This is where a little cashews and coconut oil come in handy. Not a large amount, but just enough of that healthy fat to create that fudge texture and get away from the ice cream or iciness of a typical popsicle. Chocolatey. This is the best part, right? So add away! To keep away from refined sugar and add that rich darker chocolate flavor, I used unsweetened cocoa powder. And of course, who can resist throwing in a small handful of dark chocolate chips into the mix when you’re a chocolate lover (omit for the truly refined-sugar-free option)! These pospicles already contain a double dose of chocolate. But for all you extreme chocolate lovers out there, drizzle some melted dark chocolate on top to go for that extra dreamy feeling! If you’re a chocolate lover like me and need that drizzled melted chocolate layer on top, it’ll only take an 10 minutes after the popsicles are frozen! The only problem you’ll have is wishing you made more! If there’s one easy recipe you need to make this summer, it’s hands-down this creamy fudgesicle! Summer in our house just isn’t the same without them. And find out what I’ll be doing more of this summer after the recipe! Looking For More Healthy Popsicle Recipes? These are the most indulgent, creamy, rich, chocolate fudge popsicles you'll ever devour. They're made out of clean whole ingredients, with no refined sugar! In a food processor or Vitamix , combine all ingredients, except for chocolate chips if using. Process or blend until completely smooth. Note that I've used both a food processor and Vitamix to make these popsicles and they both work well. If you are using a Vitamix, you may need to push down with a Tamper while blending. (optional) If using, add in the chocolate chips and pulse to break them up. 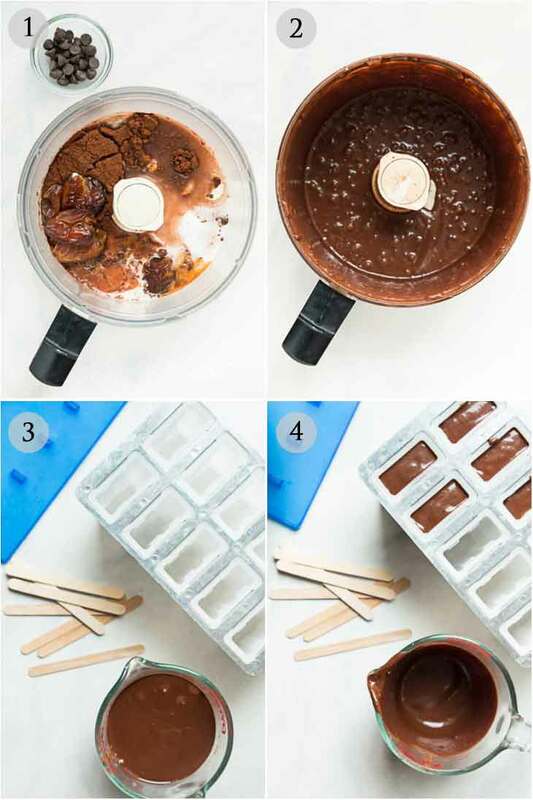 Pour the chocolate fudge mixture into Popsicle molds or your favorite freezable containers. Freeze for at least 24 hours and enjoy these delicious creamy frozen treats! Place a baking sheet in the freezer to cool. Remove the fudgesicles from the molds one at a time. Place in container and in freezer until ready to coat to avoid melting. 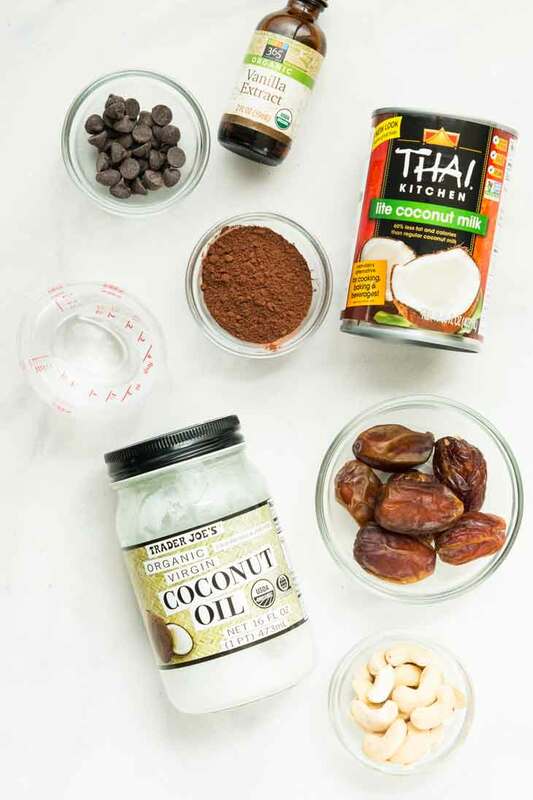 Melt a handful of dark chocolate chips along with a tiny amount of coconut oil in the microwave in 30sec increments until completely melted, mixing in between segments. Alternatively you can melt the chocolate chips over a double broiler stovetop. Line a baking sheet with parchment paper. Remove the fudgesicles from the freezer. Working quickly, drizzle some melted chocolate over the top of each fudgesicle and place them flat back down on the parchment paper. Once they are all done, place the baking tray with the fudgesicles back in the freezer for about 10 minutes or until the chocolate hardens. 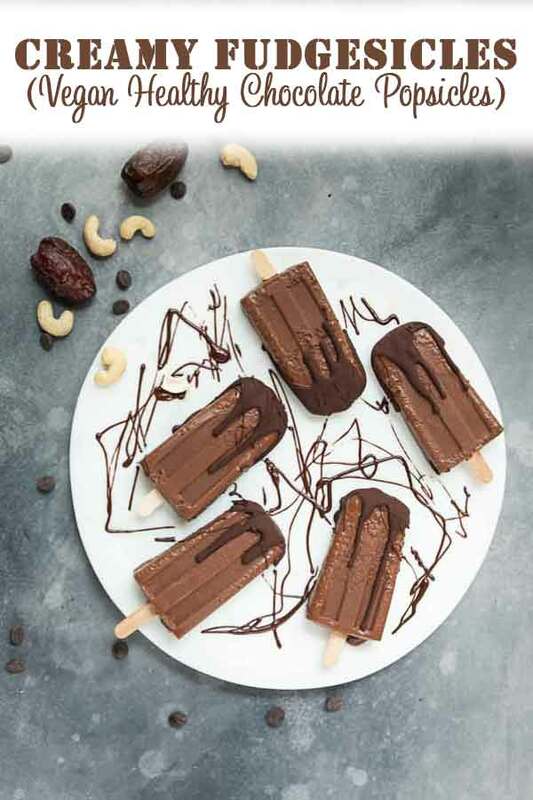 Remove tray from the freezer, store the fudgesicles in an airtight container, using parchment paper in between if needed, and store in freezer until ready to devour! Coconut Milk - I prefer using Lite Thai Kitchen Coconut Milk, but for an even creamier popsicle, you can use the full-fat version as well. Filling Consistency - If you use a large food processor as opposed to a blender, and make one serving, you may not end up with a completely smooth puree when pulsing due to the lack of volume. This is completely fine as long as you don't have pieces of cashews and dates still in the mixture. The fudgesicles will still taste great once poured into the molds. Just be sure to scrape out all the filling from the sides. For a completely refined-sugar free treat, omit the chocolate chips and chocolate coating. On a side note, if you haven’t recently ridden a bike, you should. My husband recently bought bikes for himself, my son and me, with an attached child seat for my daughter. I don’t know about you, but I personally have not owned, or really ridden a bicycle since I was in high school. I hope you’ve had more opportunities than I have, but riding has been exhilarating, even if only for 20 minutes a day. So far, we’ve been using them for leisurely rides around our beautiful neighborhood or along the canyon. My daughter loves to catch any glimpse of the many hot air balloons that take off and land near our home. I’ve been getting a sense of freedom as I ride my bike. Maybe it’s because of everything that reminds me of my Dad this time of year (the donate for life walk, his birthday, Father’s Day, and a week later when he passed), but I feel a sense of enthusiasm, freshness and wonder when I’m riding a bike. Going down a long hill with the wind in my face almost feels like I’m flying. Biking has become my new way to relax and cleanse my mind at the end of the day. Whether alone or with the whole family, the feeling is surreal. Thank you Rashmi! They are delicious, and best of all healthy so I don't mind giving them to my kids once in awhile! BTW...thanks so much for all the continued support, I love reading all your comments =) Hope you get a chance to try out these fudge popsicles! Thanks Avani! Definitely make it for your daughter...my kids (and everyone else) absolutely love it. And the best part is that it's guilt-free and free of refined sugar so it's a great healthy alternative to store-bought Popsicle. Not to mention it tastes MUCH better. Let me know how she likes it! I love the ingredients used and how you took an unhealthy conventional ice pop favorite and changed it to a super healthy snack for adults and kids. This is a great recipe to give to kids, especially those with neurological concerns such as Autism Spectrum Disorders, ADD/ADHD and Sensory Processing Disorder. Love it! Thank you too! Thank you so much Lisa! I actually developed this recipe with my son and yes, it's a perfect guilt-free treat for my kids, and for us, which is what I love most about it! Not to mention it tastes delicious. I hope you get a chance to try out the recipe. Thanks for visiting my site! IT looks delicious, will try this next week if every thing goes OK. Awesome - I promise you will love it! I've already made 4 batches with my kids. Let me know how it goes if you get a chance to try it out. I have two kinds...I bought this Norpro one online and it is very basic...fits many popsicles and easily fits in the freezer. The only one problem I have with it is that you have to remove the entire top lid everytime you want to take one out, which is totally do-able and not that difficult, but sort of annoying. Although I haven't found a smaller one to contain so many popsicles. There is also this one from Tovolo which has the nice drip guard that comes in handy with the little ones like my 2 yr old, and they easily come out individually. Finally, I also bought these other Norpro molds that are fun shape for kids (although I've never made these popsicles using this mold, I think I may try it next time...fun for the kids). I found some drip-guard ones at target on sale after the summer once that I love, but haven't found them online. Those are your options =) Hope that helps!BTW...these totally cute my sweet tooth!! Thanks a ton! Just ordered the tovolo. Can't wait to try these pops out. awesome! you will LOVE them...let me know what you think once you try them out! Mmmmmm...Absolutely LOVED them!! Thanks for this wonderful recipe. I can see lots of popsicles being made in the future :) Have you tried any other non chocolate ones? YAY! Excited that you tried them out and loved them! They are our favorite...I actually developed a vegan orange julius popsicle...it's in the fridge and tasted great before it went into the molds...so waiting to try them out before posting. But other than the random mixed blended fruit popsicles, I haven't developed others yet...but hoping to soon. But I did make a vegan raw cheesecake recipe from another blog that I loved! And I can easily see the filling going into popsicle molds for creamy pops! I had posted them on my FB feed awhile back. Let me know if you need the link! Thanks so much for the comment! these are so delicious! they are probably our favorite dessert around here (kids age 2, 4, and me!, my husband's more of a fruit guy). we've made them 3 times in the past two weeks! the last time, we added a spoon of peanut butter which was good too. thanks so much! Awesome!! Aren't they amazing?? I never get over how creamy and fudge-like they are, not to mention guilt-free. For your husband, try out the orange julius popsicle recipe =) I'm hoping to have a few different non-chocolate popsicle recipes coming over the summer. BTW...definitely adding the peanut butter next time I make this recipe =) Thanks for the comment and following! I just made these earlier today and they're soooooooo perfect! I have made a lot of different fudge popsicles and this is by far the best. This is a keeper! Thanks so much for developing and sharing the recipe! Absolutely delicious! Yay! I'm so glad you think they are perfect! =) My family loves these popsicles, and it's so nice to be able to make them at home with clean ingredients, not to mention it's super easy! Thanks again so much for letting me know, the feedback is great! I just posted a recipe roundup you may be interested in...refreshing summer treats! I have a few other favorites in there as well! I made them today. Luckily I have a quick pop maker. So we had popsicles after ten minutes. I used instead of dates maple sirup. My children and I love the popsicles. Thank you for this great recipe. So yummy! So glad you loved them! Those quick pop makers are awesome! So glad you loved them, these are a staple over the summer. I've only ever used dates, so nice to know maple syrup works well! These are so rich and creamy and chocolaty, not to mention filled with clean ingredients! Thanks for making them and glad you guys all loved them! I also posted some creamy strawberry coconut ones earlier last month! They look delicious, but, my cardiologist says a big NO to coconut. Too much saturated fats. Coconut is very heart-healthy. But doctors go by what the ABC organizations say which is still very much a low fat, low meat diet and recommend things like vegetable oils/canola (very unhealthy). Thank you! You'll LOVE them! Let me know if you try the out. I either use a powerful food processor or vitamix for this recipe, and therefore did not soak the cashews. If you are using something else then yes, I'd recommend soaking the cashews so that they blend in well. It wouldn't hurt to soak them regardless. As for the coconut milk, i used the whole can, but mine was not separated. I believe I used light coconut milk. I LOVED these!!! So easy to make & great chocolate flavor. They aren't too hard or soft once frozen & freeze well. If you're a fudgsicle fan these will be your go to! I rarely leave comments &/or ratings but I think everyone should know about these delights! Highly recommend! Aww thank you so much! I love hearing the feedback so appreciate the comments and ratings. My kids LOVE these as well...and you're exactly right. I wanted to make these more fudge like instead of a hard popsicle. Thanks again!